My mother’s parents had one of the most loving marriages I have ever seen. Their love was forged through hard times and struggles, working their fingers to the bone for everything they had throughout their entire marriage. Born in 1886, my grandmother Laeuna was the eldest daughter of Clay Cooper, a rough-and-tumble Texas cowhand and bear hunter, and Effie Mae Harman, a well-educated, beautiful schoolteacher with a finishing school education. Effie and Laeuna were tough and capable frontier women able to cook equally well over a campfire or woodstove. They could ride and shoot with the best, yet were always perfect ladies. 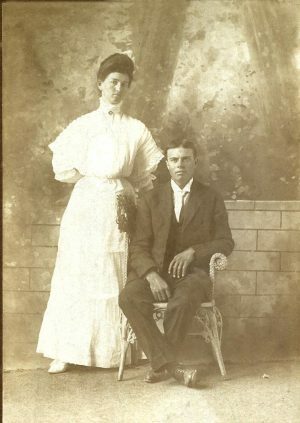 Laeuna’s family traveled from Jacksboro, Texas to the New Mexico Territory in 1887. After working for many ranchers, including Texas cattle baron, Bill Slaughter and others, and taking much of his pay in cattle, Clay was able to start his own herd and homestead. Eventually, Clay and Effie added seven more children to their family. In the early 1900’s, they purchased the Cross V Ranch in what was then the vast and lawless Socorro County. My grandfather Archie Hudson, born in 1885, was eldest grandson of a prosperous family in what was then Lincoln County, New Mexico, several hundred miles to the east. His parents, Ed and Mary Corn Hudson came to New Mexico from Kerr County, Texas in 1878 by wagon train with six other families, my great uncles even meeting up with Billy the Kid on the way. When they arrived at the Pecos River, near the site of what would one day become Roswell, New Mexico, they lived in dugouts along the riverbank until they could buy land from John Chisum, one of the brothers known for blazing the famous Chisum trail. Ed and Mary fell in love on the trip, but as she was only 13 and he 16, they waited until she was16 to marry. By that time, Mary’s mother had died and when she was 18, her father remarried a woman 29 years his junior and two years younger than Mary. When the Hudson’s packed up and moved to Socorro County, Ed and Mary took their young family and went with them, leaving behind the wealth of his mother’s father and the land he had gifted to them. Both Ed Hudson and Clay Cooper were popular fiddlers and dance callers in the area, and it is believed that Archie and Laeuna met at a dance. Archie learned to play the fiddle from his father, and Laeuna often accompanied her father on the guitar. Clay Cooper was very ambitious for his family, having sent his older daughters back to Texas for finishing school, and not crazy about his daughter falling in love with a farmer. The Hudson’s were farmers; however, Archie and Laeuna began courting. Archie won Laeuna’s heart from the beau her father had chosen and she never had eyes for another. From then on, they accompanied each other, not only playing for dances, but in every aspect of life. Archie would ride out to the Ranch and they would go riding. When someone commented that it must have been difficult to get very close to one another on horseback, Laeuna said that if he had tried to kiss her she would have knocked him down. She probably would have! In April of 1908, Archie and Laeuna were married in front of the big fireplace at the Cross V Ranch. It appears that only family were present and her father, claiming his daughter would always be poor for marrying a farmer, remained on the back porch during the wedding. She wore a beautiful white Victorian wedding dress, handmade by Laeuna, her mother, and sisters. The skirt is still in my mother’s cedar chest. They lived with her family while Clay attempted to teach his son-in-law to be a rancher, but Archie loved to farm and they eventually moved to wherever he could work for a farmer or rent farmland. He never had his own farm, often working for the highway department or doing trucking to make ends meet. They were blessed with eight children in 22 years, my mother being the youngest. Laeuna’s parents purchased the vast and beautiful NH Ranch, not far from the Cross V in 1916. Archie and Laeuna were living in Alma, New Mexico, about 44 miles away when Laeuna’s father and one brother were murdered and another brother shot in their home corral by neighboring sheep ranchers in a fight over cattle vs. sheep and water rights in May 1918. After losing their ranch to the bank in 1922, the Coopers moved to California near Effie’s brother, fearing further reprisal from the culprits who were never brought to justice. Archie and Laeuna remained behind in New Mexico with Laeuna keeping her children at home behind locked doors whenever the offending neighbors came to the small town of Reserve, New Mexico where they had settled. Their home burned to the ground in the late 30’s along with everything they owned and the children stayed with friends until Archie was able to build a log home they lived in for many years. After struggling to make ends meet, Archie suffered a devastating bout of depression and they moved to Albuquerque with their younger children in 1945. I remember my grandparents as a very devoted couple, helping each other when he became deaf and she almost blind. One of my favorite memories is watching him place a wad of chewing gum on the bottom of his cane and directing her until she was able to pick up a piece of lint off the floor. Always talented with needlework, she continued to crochet potholders even after losing most of her sight. I still I use them to this day. As they became older, it became necessary for them to move from their home where I experienced many wonderful years of Sunday visits with some 28 cousins and the many family friends who often stopped by. I met people who remembered the Wild West years of southwestern New Mexico and spent many joy-filled hours sitting on the floor listening to stories that filled me with a love of family, history, and storytelling that continues to this day. Many of those stories and more will form the backbone of a historical series I am researching. While living in a nursing home, Laeuna would feel her way two halls over to Archie’s room and spend the day at his bedside. When he sat next to her in a chair, he would say lovingly, using his pet nickname, “Ma’am, you’re still the prettiest girl I ever saw.” She would resolutely remove his hand from her knee, place it back on his lap, and tell him to behave himself. Laeuna died a few weeks short of a year following Archie’s death. Few children these days have the weekly gift of the love and closeness of a large extended family that I grew up experiencing. My grandparents may have indeed been poor, but they had a wealth of love and the respect of everyone who knew them that I would exchange for riches any day. Norma Gail is the author of the contemporary Christian romance, Land of My Dreams, winner of the 2016 Bookvana Religious Fiction Award. The sequel is almost finished. A women’s Bible study leader for over 21 years, her devotionals and poetry have appeared at ChristianDevotions.us, the Stitches Thru Time blog, and in “The Secret Place.” She is a member of American Christian Fiction Writers and Romance Writers of America. Norma is a former RN who lives in the mountains of New Mexico with her husband of 40 years. They have two adult children. Norma: The books I told you about are all out of print, but can be found through book outlets such as AbeBooks. A story of my great grandfather Cooper ( my grandmother’s father) guiding artist and author Fredric Remington can be found in two books of his Pony Tracks and Fredric Remington’s Own Outdoors. He is the one in the illustrations with a bandage around his face from being shot in the face in a poker game. The story of my Hudson family ancestors trek from Texas to New Mexico and their run-ins with Billy the Kid, Pat Garrett, and John Chisum can be found in Pecos Pioneer by Mary Hudson Brothers and Martin V. Corn: Early Roswell Pioneer by James D. Shinkle.